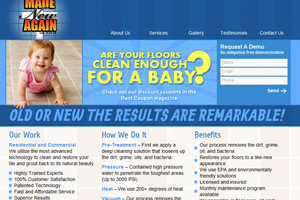 Big Splash Web Design and Marketing created a custom flooring website design for Made New Again, a local business specializing in cleaning and restoration of hard surfaces, such as tile, grout, concrete and brick. The company needed a new logo, as well as a new website with an updated design and more flexibility in managing content. We were able to design a site that not only met these requirements, but also streamlined the customer contact, added customer testimonials, and allowed Made New Again to better showcase their services, including video demos of their cleaning processes.